Thank you so much! Monkey has made his way home and we have one excited little boy. THANKS! I bought monkey at an Old Navy store back in the spring of 2008. 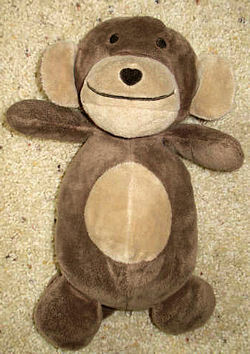 Monkey is brown with a light brown tummy and face, stubby little arms and legs, and a heart shaped nose. My daughter took to him before we had even left the store! She took him everywhere, and if her hands were full, she would stick his face in her mouth and carry him that way! Well, recently we were on a walk around our neighborhood when monkey went missing. When we went back out to look for him he was nowhere to be found. Needless to say we had a very rough night that first night. I did everything that I could think of, I was on the internet posting wanted ads, and looking for anything or anyone that could help. I even made up flyers with a picture of monkey that I hung on all the signs around our neighborhood. Fortunately last night a little girl called me and told me that she had found monkey, and wanted to bring him back to us. I’m sure that any mother could imagine my relief! I am happy to say that monkey is now safe at home, no more sleepless nights… for now anyway. After this experience though I am desperate to find a back up monkey for my daughter. It has got to be one of the worst feelings in the world, not being able to comfort your child’s pain, and I just have to find another one!!! Monkey is brown with a light brown tummy and face, stubby little arms and legs, and a heart shaped nose. If you can help Bethany find this Old Navy Brown Monkey with Tan Face and Tummy & a Heart Shaped Brown Nose, please Contact Us, including #093008-1 in the subject, .